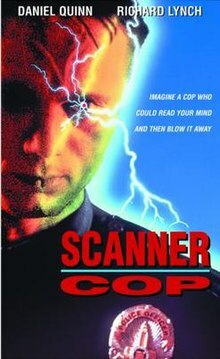 Scanner Cop is a 1994 Canadian film. It is the fourth film in the Scanners series and the first film in the Scanner Cop series. It was written, produced, and directed by Pierre David. Sam Staziak, a rookie cop with the Los Angeles Police Department, is also a 'Scanner' (a person born with telepathic and telekinetic abilities). When a string of murders begins to decimate the police department, Sam faces sensory overload and possible insanity as he uses his powers to hunt the man responsible for the killings. The film was released on VHS by Republic Pictures. A DVD has been released in Canada, along with the sequel Scanners: The Showdown (also known as Scanner Cop 2). ^ "Scanner Cop (1994)". CultCelebrities.com. Retrieved March 3, 2019. This page was last edited on 29 March 2019, at 21:01 (UTC).